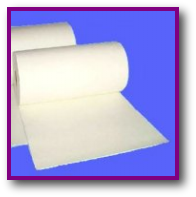 CerMax extreme high temperature and heat resistant ceramic fiber paper is an excellent replacement to asbestos. Light-weight, flexible and good handling strength. Provides low thermal conductivity and good dielectric strength, and features excellent corrosion resistance. Can be die-cut or stamped into shapes.